With the addition of these languages, Google Translate can now interpret and convert a total of nearly 50 languages. 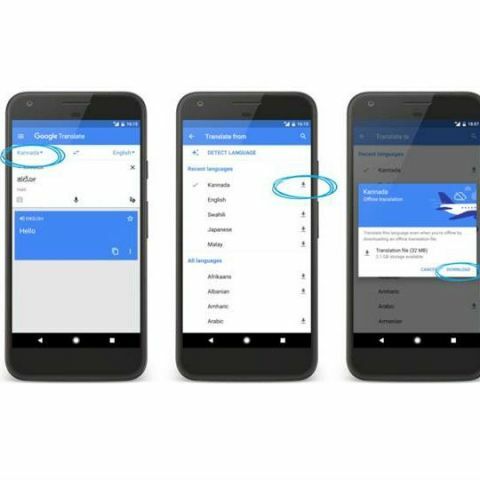 Google has announced that its translate service can now interpret and convert 13 more languages into one that a user easily understands. The company has started to roll out the update for both Android and iOS app users worldwide, VentureBeat cited a company spokesperson's quote. According to the report in the tech news platform, the new 13 languages include, Hindi, Bengali, Punjabi, Gujarati, Kannada, Tamil, Telugu, Malayalam, Marathi, Nepali Arabic, Thai and Vietnamese. The addition of Arabic, Bengali, Hindi and Punjabi to the list means that the camera in the Google Translate app now knows how to recognise four of the top 10 most spoken languages on Earth, according to Babbel - a language-learning platform. In 2015, Google added the visual translation feature to the Translate app with the support of 27 different languages. It allows users to translate text on food menus and billboards, etc in real time, making communication in a foreign country easier. To translate a language that you don’t understand, you first need to download the Google Translate app in your Android or iOS smartphone. Once done, simply open the app and choose the camera icon, align the text in the given area on the screen and then select text that needs to be translated. The app will analyse and carry out the translation in real-time. You also have an option to download a language pack to carry out offline translation. New translation capabilities with computer vision that have been introduced utilise Neural Machine Translation (NMT), a neural net-driven approach that got an upgrade for better offline translations earlier this year. Citing the spokesperson, VentureBeat says that optical character recognition from Google Cloud Vision API was used to train new datasets for the new 13 languages. The news comes a day after the company announced that Google Lens comes integrated with the camera app and can now scan business cards, identify objects and landmarks, and capture information from the viewfinder to give users recommendations in real-time. You don’t need to be online, Google said. In other news, the company has made other software improvements as well. The new features on mobile include a faster way to activate Assistant. Users can now summon the Assistant without manually unlocking the device. There is a new visual overview of your day whihc can be accessed by swiping up after the “Hey, Google” command. According to The Verge, the new overview will show users their recent notes, event recommendations and reminders. Do Micromax come pre-loaded with Hindi or any other regional languages? ?